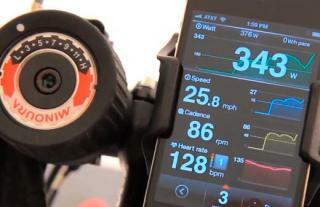 The LR960 is Minoura’s best turbo trainer and is part of their LiveRide Series of trainers. The LR960 uses Minoura’s most powerful Twin Mag resistance brake to output 584 Watts and 1001 Watts of power at training speeds of 40km/h and 60km/h respectively. Like all of the LiveRide Series of trainers the LR960 is compatible with various pieces of software that are accessible via Apples iOS mobile devices. These include the Live Training software that allows you to measure and display vital metrics such as power output and cadence, and also upload your own GPS courses to workout to or download pre-programmed courses displayed on maps visualised through your mobile device. There is also the Sufferfest program where you can ride with real life race videos, or the Cogman iOS app where you can race in a virtual environment. The Minoura LR960 turbo trainer uses dual neodymium magnets in its magnetic rear wheel resistance unit, and a large 2.7kg virtual flywheel to create more realistic inertial forces for you back wheel as it spins. Via a handlebar mounted quick release resistance shifter you can set the resistance of your trainer to any one of 13 different levels as you workout. 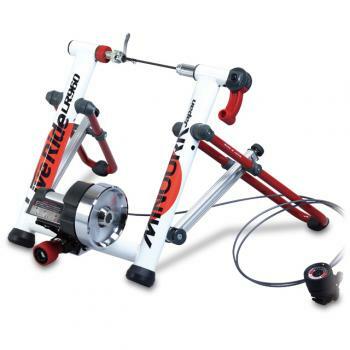 Unique to theVR960 turbo trainer, it uses a special lightweight but very stable frame with U-shaped legs that can be adjusted to +/- 10mm in height. 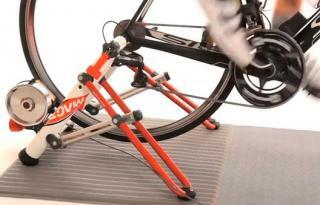 There is a double thread roller pressure adjust knob and a quick release hub clamping handle on this trainer.